We are now very close to the June 28 deadline for a decision on phase two of the Brexit negotiations - which is supposed to resolve the future of the Irish border, amongst other things, writes Paul Gosling. It is on June 28 when the summit of EU leaders in Brussels takes please. The Irish and French governments, in particular, have been very clear that the Irish border solution must not be a fudge. We do not have greater clarity over the UK government’s position. It is seeking continued membership of the Customs Union, along with regulatory alignment, until such times as technology is developed. This would provide for frictionless trade with the EU, including the retention of an open Irish border. This technology is likely to take several years to develop and might never be developed. So this ‘solution’ is not favoured by Brexiteers who worry they may be sucked into indefinite membership of the Customs Union. They may yet scupper the proposal either in Cabinet or Parliament. The proposal may, though, be enough for Theresa May to avoid losing a vote in the House of Commons on her Brexit negotiations. Most MPs probably support staying in the Customs Union and having the closest possible relationship with the EU - but party discipline will prevent most from voting with their beliefs. Nor does it necessarily deal with the other half of the border problem - regulatory alignment. More difficult still, the UK is seeking something very close to continued membership of the Single Market, without accepting the rules - paying for EU membership, political engagement, or free movement of labour. It seems likely that the EU will reject it. So, even though we now know what the UK government wants from Brexit, there is still a large amount of uncertainty over what will actually happen. This makes it extraordinarily difficult for businesses to plan and invest. Similarly, it makes it very difficult for individuals to make plans for their jobs and careers. The latest Holywell Trust Brexit podcast considers the difficulties for local businesses, particularly those in the hospitality sector that are dependent on EU workers to fill jobs that are otherwise difficult or impossible to recruit to. We interviewed both Jennifer McKeever, President of the Londonderry Chamber of Commerce as well as chief executive of Airporter and Brendan Duddy, of the Duddy Group, which has interests in hotels in Derry and Portrush. Both explain the worsening recruitment difficulties being faced by local businesses. 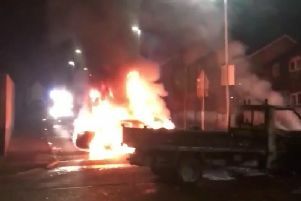 Ulster University’s Paddy Nixon has also gone on the record over the last few days, talking about the damage being done by Brexit to the Magee campus. He told the ‘Irish Times’ that there has been a fall in student applications at Magee which he puts down to Brexit. Meanwhile, the Governor of the Bank of England, Mark Carney, has said that real household income in the UK has fallen by £900 so far because of Brexit. At the same time, we have falling unemployment. This might suggest what is happening underneath the surface in terms of the economic impact of Brexit. And it is not simple. The fall in the value of the pound after the Brexit vote helped make UK businesses more competitive, increasing exports and increasing jobs. However, the real value of workers’ income has fallen because of the drop in the value of sterling. That is a particular problem for people who work in Derry and pay a mortgage in Donegal, for example. They are significantly worse-off because of Brexit. In addition, uncertainty around Brexit is leading to many businesses delaying investment decisions. That is true of businesses in and around Derry, on both sides of the border, which I know have put off investment until they are clearer about what will happen to Brexit and the border. Investment is one of the key factors underpinning productivity growth. And what we are seeing is a fall in productivity. This suggests that low levels of investment are causing the drop in productivity. This may actually increase demand for employment in the short-term, but it also reduces profitability and is likely to lead to longer-term falls in demand for workers. A different interpretation is that Brexit might lead to more jobs, not just in the short-term, but with lower productivity and lower real wages. At present, it is too early to tell. Especially as we have little idea of the actual shape of Brexit - two years after the referendum vote.